I decided to take photos of the muskeg and mountains in the area where I live and combine them into a panorama image. I took a series of five photos and overlapped the edges in order to combine them correctly later. I used a focal length of 40, shutter 1/160 , aperture f/9.0, my ISO was 100. I used auto focus with this series of pictures. In editing these together, Photoshop CS6 has a feature in which I was able to do a photo merge to automate the combining of the photos. Nice! There were several options in the photo merge menu. I used the option of reposition and liked the result. I cropped out a small bit at top and bottom of the image where pixels were missing. I’d taken the pictures in the early morning but there was a haze of clouds that dimmed the light some. In Photoshop I added a cooling filter to help make the sky appear brighter and bluer. I also added a slight vibrancy adjustment. I made very small adjustments with the brightness/contrast and curves, but it didn’t need much at that point. I flattened the layers and resized the image. Although I was a little disappointed while shooting the photos that the early morning colors weren’t quite what I’d wanted, I’m relatively happy with this final result. 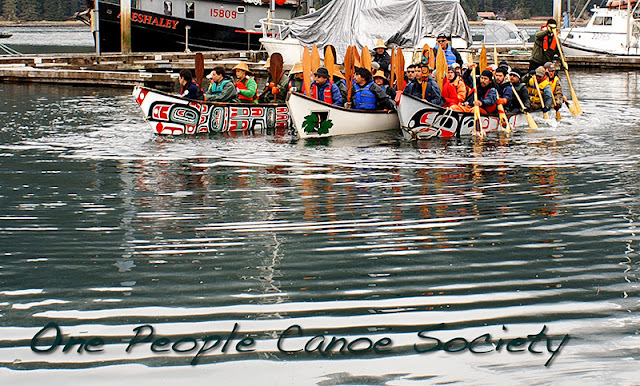 During a break from work, I grabbed my camera and ran down to the dock to try and get photos of the One People Canoe Society canoes which were arriving in Petersburg on their journey to Wrangell for the Chief Shakes Tribal House rededication. I took a series of photos of the paddlers coming down the Narrows and into the harbor where a crowd of local people were singing songs, chanting and drumming to welcome them. It was drizzling and the canoers were tired, but they followed cultural protocol and asked for permission to come ashore. With permission granted, the three canoes in tandem paddled away from the dock, turned around to back into position next to the dock. This photo was taken as they were manuvering the canoes around. I had set my camera in landscape mode hoping to keep everything in the photo focused. My shutter was 1/80, aperture f/6.3. The focal length was 26 mm and ISO was 100. I wanted to add text to this photo for this assignment. In Photoshop, I first cropped the image to reduce the background clutter and I wanted the canoes to be more prominent in the photo. I sharpened the image and I used curves to make slight adjustments to highlights and shadows. I added a text layer deciding to use a handwriting font. I added a drop shadow and chose a color from the image itself for the text. Thank you for reading about my adventures using Photoshop CS6. Feel free to leave comments below. This entry was posted in Photography on May 4, 2013 by Tammy. For Project 3 our assignment was to submit four pictures that express our individual voice as a photographer. That was a tough one for me because I wasn’t exactly sure if I had a voice as a photographer yet. I usually just take pictures of whatever catches my eye and attention. I decided to explore finding my “voice” by zeroing in on architecture. 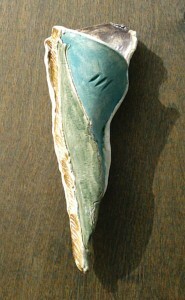 I love seeing all the different angles and textures found in buildings, so that is what I chose to do for this project. Some of the pictures I took for this project were close up views of some part of a building and others included more of the building but from an angle or view that I found intriguing. Have I found my “voice”? If you’d like, share your thoughts in the comments below. The day I went out shooting for this photo it was overcast so lighting was dim. That worked fine for this picture of an old warehouse. I set my camera on automatic and manual focus. I zoomed in on the side of the warehouse where there were two doorways, one on top of the other. 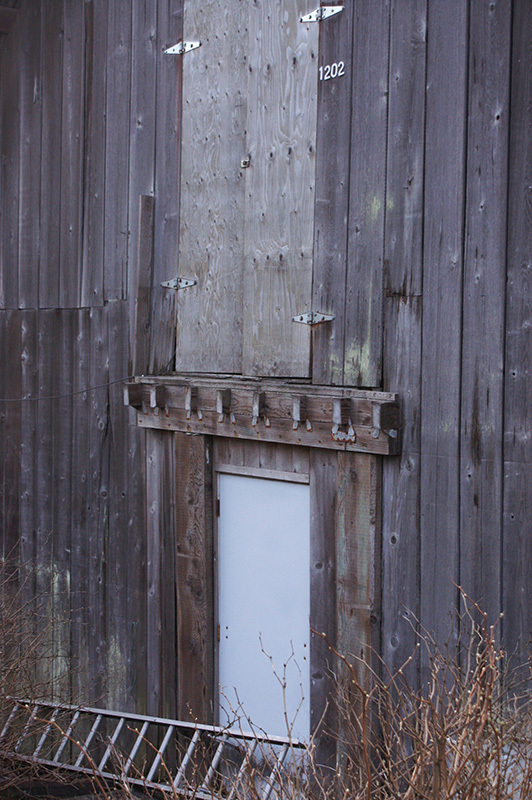 A ladder laid askew in front of the lower entrance. The top door looked like it probably went into a loft. Perhaps the ladder is used to access the top doors? My camera focal length was 45 mm, my aperture 5.6, shutter 1/50 and the ISO was 800. In Photoshop I decided to brighten this image a little bit and adjusted the contrast but not much, I liked the feel of the weathered gray wood in low light. What drew me to take this picture was the texture of the old wood, the angle that the ladder added and how the threshold of the top door vaguely repeats the ladder pattern. I framed this to include some bushes in the foreground to give depth and soften the bottom edge. There was a break from the drizzle when I decided to go for a walk with camera in hand. The light, again, was dim from the low overcast sky. This building appears to be abandoned but may be used as storage now. It sits along one of the early Petersburg streets, and it may be one of the town’s older buildings. I think it’s kind of sad that it is falling into disrepair. I find the architectural details, even in their poorly maintained state, to be kind of beautiful. 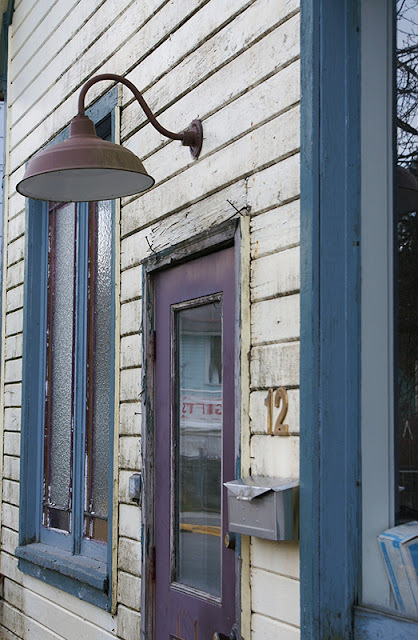 I mean, look at that lamp, the crinkled glass, the colors, and the various textures this building sports! For this picture I leaned into the building to find an angle that I found interesting yet still captured a great deal of the front of the building. I set my camera in landscape mode in an attempt to increase depth of field. My hope was to keep the whole area focused. A little of the foreground softened a bit but I still liked the way the image came out. My shutter speed was 1/125, aperture f/5.6 and ISO was 250. I used manual focus and no flash. 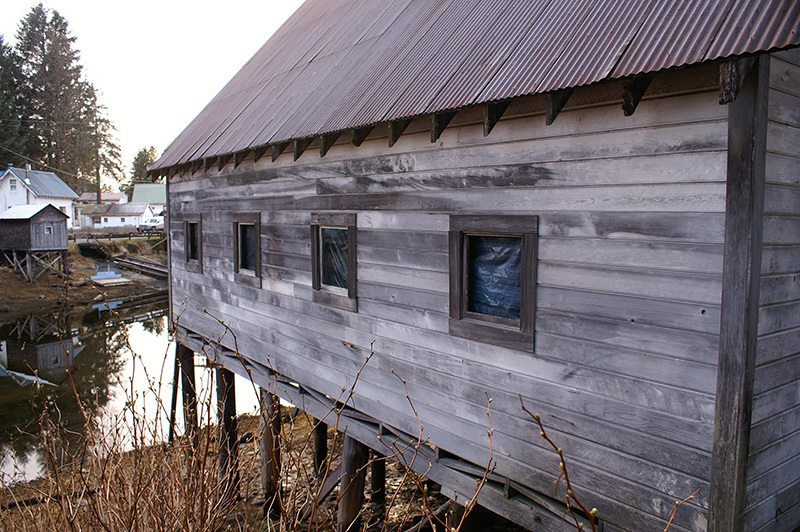 I liked the angle and textures I saw in the siding of this warehouse by the Slough. The day was high overcast but still relatively bright outside. I used my camera’s landscape setting, again to try and keep the whole building in focus. According to my camera data, my focal length was 18 mm, shutter was 1/30 and aperture was f/3.5. I used manual focus and framed the photo to show a little of the slough and the buildings across the slough. In reviewing the photo later, I played around with cropping those out but in the end I decided I liked how that little gray warehouse across almost mirrored my subject while it was being mirrored in the water. I also framed this with some bushes along the bottom of the frame helping to lead the eye up into the picture and warehouse. To me the windows of the warehouse lead my eyes to the small warehouse across the water, then I see its reflection and the branches kind of pull my eye back around and up to the warehouse again. Although some of that was an unconscious decision, I quite like how it worked out. It was a sunny afternoon when my husband suggested we walk the bike path along the Narrows. Earlier that day he’d spotted an iceberg that had been stuck on the beach at low tide. He thought I’d like to take a picture of it (which I did). This big house was in the vicinity, so I decided to photograph its textures and angles. 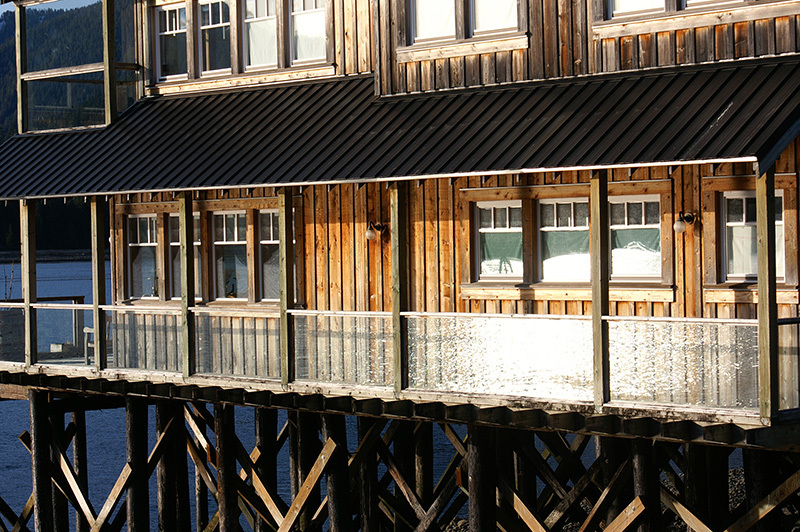 I’d taken several pictures from low, down on the beach, but after we climbed back up to the bike path, I spotted this shimmering water being reflected in the plexiglass sides of the deck, I decided to try and capture that along with some of the building’s various textures and angles. I had my camera in manual focus. Trying to show a lot of different textures, I set the camera to landscape mode so I could focus in on the shimmer while keeping the rest in focus too. My focal length was zoomed to 60mm, f/8.0 and shutter was 1/250. ISO was 100. I filled the frame with just part of the building but I included some of the water in the frame to hint to the fact that this house stands in water when the tide is in. I included a little of the pilings as well as the angled overhang roof, wood siding and windows with white frames. This entry was posted in Photography on April 22, 2013 by Tammy. 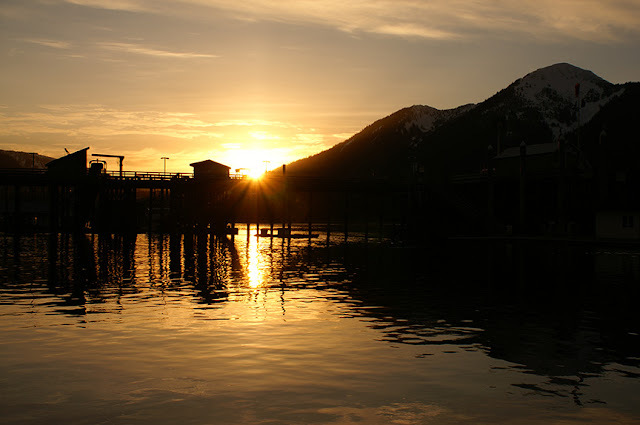 Home for me is Petersburg, Alaska. After a few weeks of taking photographs around my town and surrounding areas I wound up with about 450 photos. It was kind of tough narrowing them down to just four for the class assignment! I have also been having some challenges with my camera. It is pretty old and over time had gathered dust inside. So, I’d take a nice photo but these bits of dust would show up on the photograph. After asking around about how to get the camera cleaned, I was able to find a lens cleaning kit at the local drugstore and managed a DIY (do it yourself) cleaning. I was pretty nervous I’d mess something up but it did help and the camera still works so I guess I didn’t break anything. I think I will be able to continue to use my camera. In the picture of the driftwood stump, I had been down on the beach trying a 70-300 mm lens that I thought may not be working right. My camera was still in landscape mode while I snapped the picture of the stump. 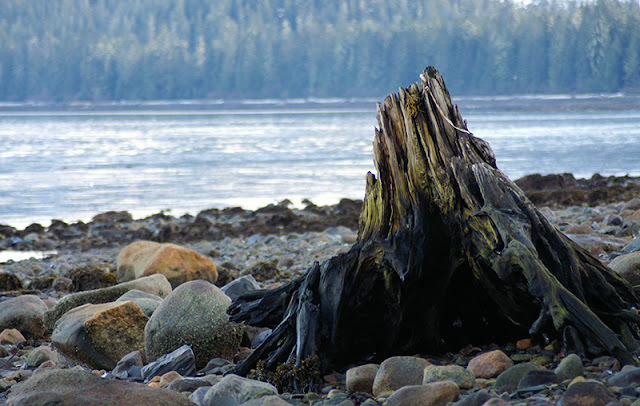 I was attempting to capture the interesting different textures of the stump and rocks surrounding it. I think I’d zoomed into the stump which caused the background focus to soften quite a bit. I liked the effect since the stump was my subject matter here. I framed the stump slightly off center while it leaned into the picture. I don’t recall if I’d switched this lens to a macro setting for this photo but I may have done so while experimenting with different settings. Many of the photos I took with that lens would not completely focus and I still believe there may be something wrong with it. The zoom function doesn’t work right anymore. I do quite like how this image came out. This was the second time I’d taken this picture. I had been down to the fisherman’s memorial the day before and snapped a similar photo, but was unhappy with the focus, which was too soft. I came back the next day, after cleaning my lens, to try it again. I decided to use the landscape setting on my camera because I wanted to focus on the ribs of the boat but also thought that setting would give enough depth of field to also keep the rosemaling, painted on the shutter of the building, in focus. 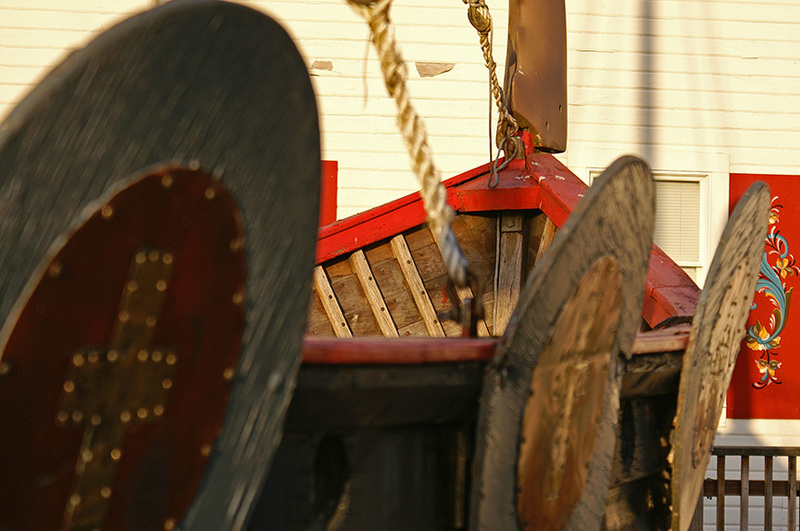 The boat is a Viking ship sitting outside the historical Sons of Norway Hall. For those who do not know, Petersburg has a heavily Norwegian heritage so these rosemaling touches are all over the place. It seemed appropriate to include a taste of those with this image and with this assignment about place. 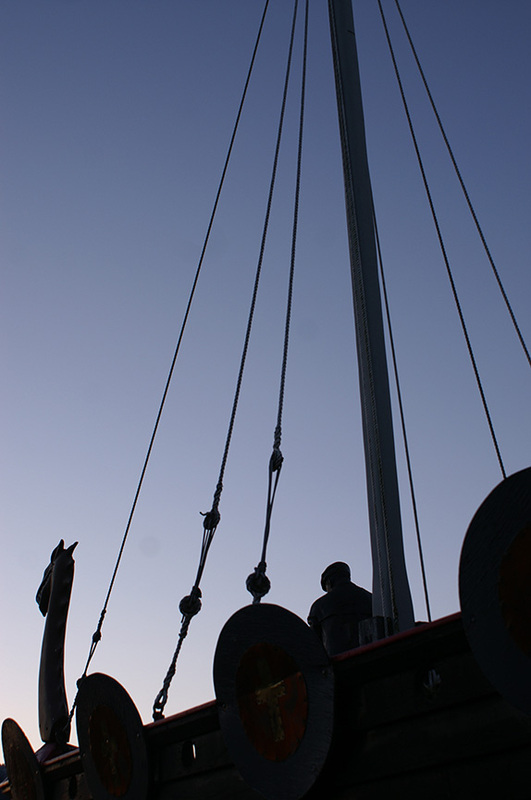 At sunset the day before taking the boat ribs photo I took this image looking up the mast of the Viking ship. I was underneath the edge of the boat pointing the camera up the pole. I switched the camera to automatic but used a manual focus. I didn’t adjust the ISO although it was getting dark by then but I wanted the shapes to silhouette against the little bit of light left in the sky. I framed the image so that the creature on the bow could be seen, the shields along the edge, as well as the figure, which appears to be on the boat. The figure is actually that of a statue located on the other side of the boat. Because of the angle and location where I stood the figure appeared to be standing in the boat itself. I’ve always been fascinated with silhouettes in artwork. I especially like how graphic this picture looks. In the sunset photo, I used manual focus but do not recall if I had the camera set on its sunset setting or if I was using the aperture priority setting. I have been experimenting with both of these settings and the different lighting settings, so I’m still on a learning curve. Previously I used my auto setting almost exclusively and only occasionally used manual focus. I have been experimenting and still learning the other special settings on my camera. I see on this images’ camera data that the exposure was 1/250 sec, f/13 and my ISO was set at 100 which is standard on my camera but it’s not clear which setting I’d otherwise used. In Petersburg last week we had a rare happening of having several sunny days in a row. I was out in it every day after work taking pictures. In this image I tried to capture the pretty colors of the setting sun reflecting in the water. I enjoy the texture of the reflections of silhouettes in the water and the little sunburst I captured just before the sun went down. This entry was posted in Photography on March 11, 2013 by Tammy. My assignment was to take four “environmental portraits of people important to me. My husband agreed to let me take his picture but since most of my family live elsewhere I was worried about finding three other people here in Petersburg who would let me take their portrait. I thought I’d ask my husband’s friend/boss but wasn’t sure who else. My teacher suggested I talk with shop owners downtown to see if anyone would be willing to be my subject. That was a great idea. One shop owner immediately came to mind. Although I didn’t know her well personally, from various interactions around town I knew that Savann Guthrie was friendly and usually sports a beautiful smile. I visited her in her shop and asked if she’d be willing to have her portrait taken. She agreed. I decided to take Savann’s portrait in her store, The Fabric Basket, a bright and cheerful environment that is surely a quilter’s haven. During the shoot, I had her stand in several different areas of the store to give me a variety of photos from which to choose for the assignment. I decided for this assignment to turn in a shot from the final setting in which she perched on a row of fabric bolts in front of a display of Valentine’s Day themed notions. I took the photos with my Konica Minolta Maxxum 5D camera using its standard 18-70 lens. Although I did experiment with a couple different camera settings during the shoot, I wound up taking this picture with the auto setting, automatic focus and without a flash. I handheld the camera. Initially I used a tripod but being kind of nervous about taking the pictures and not having much experience with the tripod, I went back to holding the camera, which felt more comfortable for me. Savann was very gracious about me taking her time that evening. I plan to share the best of each photo setting with her so she can use them as she’d like. 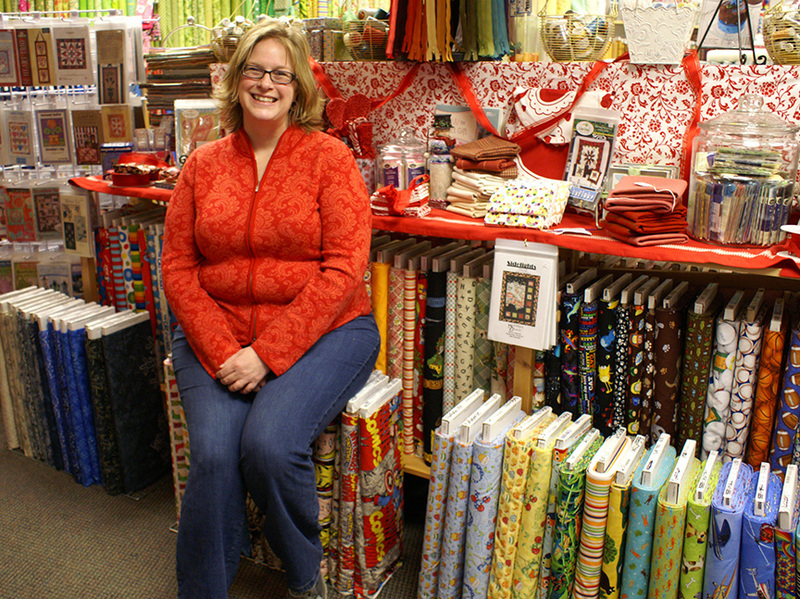 Savann Guthrie, avid quilter and owner of The Fabric Basket in Petersburg, Alaska. Feb. 1, 2013. I chose to take the picture of Doug, my husband, down near the harbor. After 30 years as a heavy equipment operator, Doug will be retiring from the State of Alaska in May. 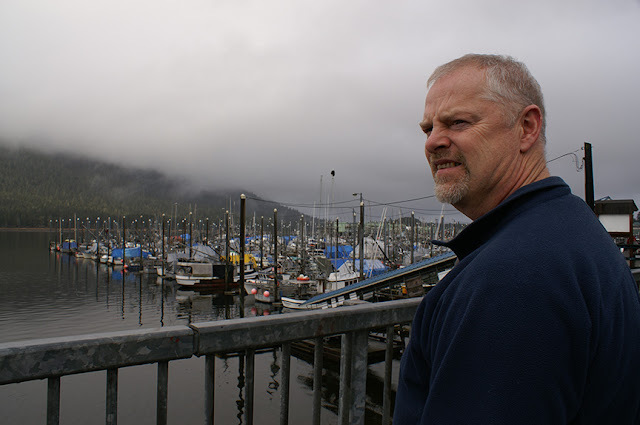 After his retirement, he plans to go back to commercial fishing, which he grew up doing. He has been dreaming of getting his own boat and going back to trolling for quite a long time so I thought the harbor setting was perfect for his portrait. Again for his portrait I used my Konica Minolta Maxxum 5D camera and the 18-70 lens. I hand held the camera and used the auto setting and no flash. I believe this was auto focus although a few shots were manual focused and I didn’t keep good records of which were which. As you will see in this picture and actually most of my photos, I tend to prefer placing the subject off to one side or the other rather than putting them smack in the middle. I took several shots in this location with Doug looking at the camera but also tried a few where he’s looking somewhere else. We walked down the ramp and I took some photos of him up closer to the front of a boat but I wound up choosing this portrait of him looking at something outside the frame with lots of boats in the background. At the time, I didn’t notice that there was an eagle sitting atop of a pole in the background. After the fact, I’m told that the eagle is sitting on the pole of a trolling boat. Devren Bennett is another local shop owner here in Petersburg that I’d approached about the portrait assignment. I did know him already, though, as he and my husband are buddies who had served together in the Petersburg Volunteer Fire Department (my husband has since retired from PVFD). Devren, who owns a computer and boat electronics repair store, did not want his portrait taken in his shop and instead suggested we do it at the fire station where he spends quite a bit of his time. Devren had warned me that he isn’t very photogenic but I decided to give it a shot anyway. We tried several different places around the station and I did have a little trouble getting decent shots of him. But from the ones that were alright, I chose to use this one of him standing next to an antique fire extinquisher. I used the same camera, Konica Minolta, and the same lens. I prefer to use natural lighting rather than a flash. I did keep my settings on automatic with auto focus. I composed the shot with him in the right hand side of the picture and hand held the camera. 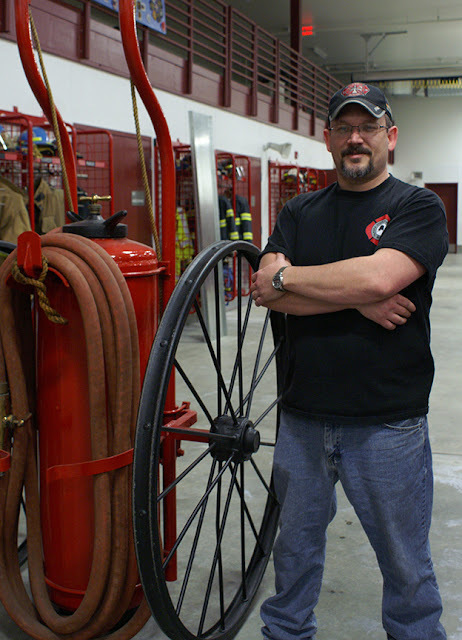 Devren Bennett, volunteer fireman and local Petersburg businessman. Feb. 4, 2013. My last portrait is of Ted Sokol who works for Alaska Department of Transportation. He is my husband’s friend and boss. He works as the airport manager and graciously agreed to let me take his picture. I decided to take Ted’s picture at the DOT shop at the airport. I took pictures of him up on equipment and some outside the shop. At his suggestion, we took a drive out on the runway. In this photo, Ted was facing down the runway before he looked over at my camera. I was a little bit challenged by the drizzly weather. The photos I took of Ted standing in front of the long runway were too dark to see his face and while I could probably adjust some of that in Photoshop, for this assignment, I decided to use this portrait of Ted which also captured the beautiful mist-covered hills next to the runway. Again I composed the shot with Ted standing off-center. I used the Konica-Minolta camera and my standard lens. The camera was hand held and I used automatic mode and auto-focus. No flash. Ted asked me to come back sometime when the sun is shining and take more photos of him. He is getting ready to retire soon to spend time with his family while he can. He’s fighting cancer. 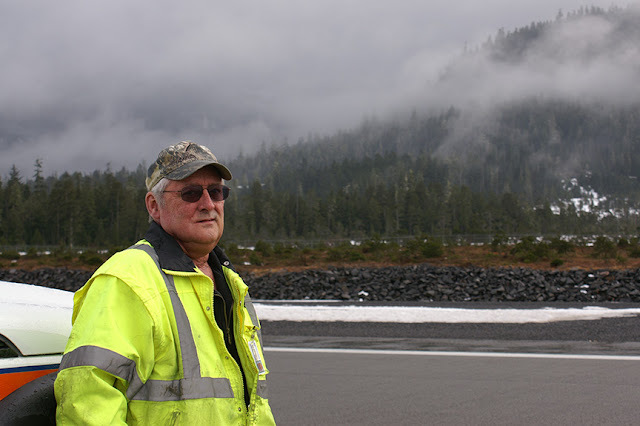 Ted Sokol, airport manager at Petersburg Airport. Feb. 7, 2013. This entry was posted in Photography on February 11, 2013 by Tammy. 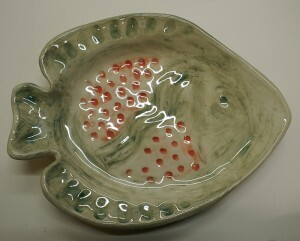 Just doing a test to see how this blogger page would work for photo sharing. These are photos that I took in fall 2012. 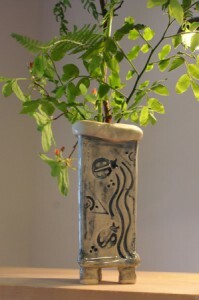 This entry was posted in Photography on February 1, 2013 by Tammy.